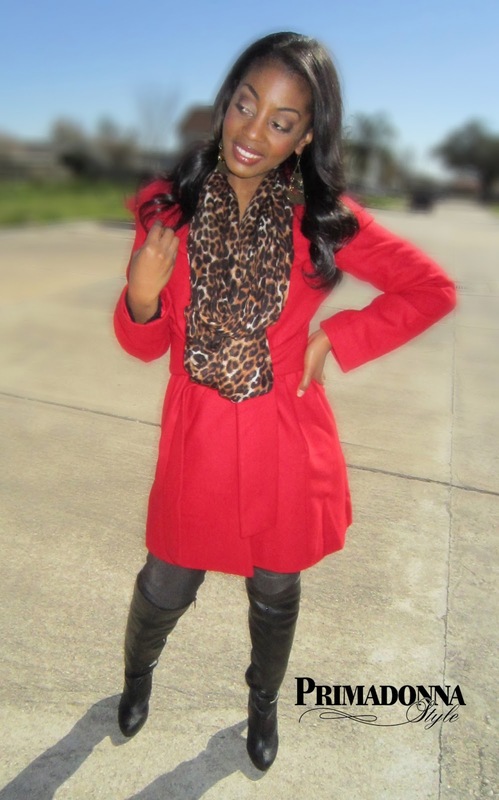 In January I created a post featuring several colorful coats all under $50. I decided to order one of the looks: featured in that post: the Merona Wool Coat with Shawl Collar from Target in Wowzer Red on clearance for just $41.98. I wasn't quite sure I liked this coat when it arrived because the red was much brighter than I thought it would be. I considered returning it, but after trying it on with a few things I realized the shawl collar would pair perfectly with scarves and I decided to keep it. The belt is attached, and the fit is true to size. This coat is heavy enough for a cool winter day, but probably wouldn't stand up to a very cold day without a number of layers. I wore it when the temperature was about 49 degrees and I was pretty comfortable. The front pockets are sewn shut but a few tugs on the thread exposes two fully functional lined front pockets. I paired it with my Express Leopard Print Infinity Scarf seen here.